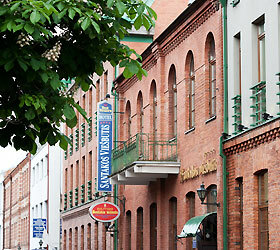 "Best Western Santakos Hotel" is located at the merging point of the Old Town and the City Centre of Kaunas. It has been offering warm and hospitable atmosphere for business travellers and holiday-makers from all over the world since 1995. The hotel surroundings include a variety of attractions, such as Devil Museum, Kaunas Tadas Ivanauskas Zoological Museum, Kaunas Castle and more. The trip to the railway station and shuttle bus station does not take much time. The hotel provides accommodation in 92 rooms of various categories - 11 Standard Single, 73 Standard Double, 7 Luxury, 1 Apartment. Non-smoking rooms are available. All rooms include - king-sized bed, air conditioner, satellite TV, wireless Internet access, mini bar, work desk, telephone, wardrobe, bathtub or shower (with heated floor), hair-dryer, safe boxes (in some rooms). Among the other Best Western Santakos Hotel facilities and services - staffed reception (24 hours), multilingual hotel staff, free wireless Internet access in all rooms, transportation from and to the airport (on order), room-service (24 hours), laundry, ironing and dry cleaning, wake-up calls, porter service, luggage storage, business corner (computer, Internet, printer, copier, fax), car parking lot and garages, souvenirs shop, safe deposit boxes (at the reception), coffee/tea maker (on request), iron and ironing board (on request), extra towels & bedclothes (on request), extra toiletries and other accessories available for order at the reception desk (bathrobes, slippers, toothbrushes, sewing kits, etc. ), rollaway beds and baby cribs available, car rental, wellness centre (sauna, swimming pool) attendance, 6 conference halls of varied capacity, European fare restaurant.